Cathy Hackl is an Emmy-nominated communicator turned virtual reality & augmented reality global speaker, producer and futurist. 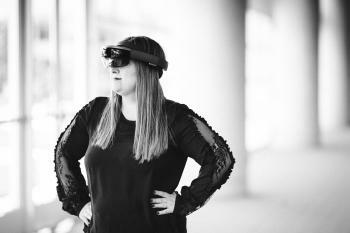 She's a Partner at Mixed Reality Ventures and works as Lead Futurist at You Are Here Immersive Labs, one of the Southeast's most prominent XR labs. Prior to that, Hackl worked as an HTC VIVE VR Evangelist during the launch of their latest headset, the VIVE Pro, and during the company’s partnership with Warner Brothers’ blockbuster, Ready Player One. She's the author of Marketing New Realities: An Introduction to VR & AR Marketing, Branding & Communications. Hackl was named by IZEA and Onalytica as a leading augmented reality and virtual reality influencer and also by NBC News as one of the top women working in virtual reality. Hackl served as chief communications & content officer for Future Lighthouse, one of the world's top VR studios focused on branded VR narrative, where she collaborated on projects with brands like Sony Pictures Entertainment, Oculus, Beefeater, and William Morris Endeavor. Hackl was also selected as a 2017 Oculus Launch Pad Fellow, a program designed to support promising diverse VR content creators and help them bring their unique ideas to market. She's the founder of Latinos in VR/AR and has spoken about VR and social media in more than 10 countries. Hackl has been featured in media outlets like Mic, CNN, Silicon Beat, Entrepreneur, CMO.com, Forbes, VentureBeat and Mashable. She is a global advisor for VR AR Association and a leading voice in the VR AR marketing space. Before working in AR, VR and social media, Hackl worked as a journalist for CNN, Discovery Communications, and ABC News. She's also the creator of the holographic press release. She loves all things mixed reality, tech, AI and blockchain.